The following video shows an example of the slot-tuck flex, starting at about 2:06. 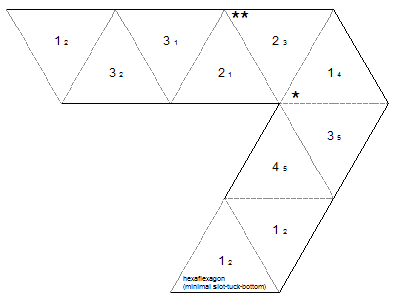 See the 12 leaf hexaflexagon for a good use of this flex. 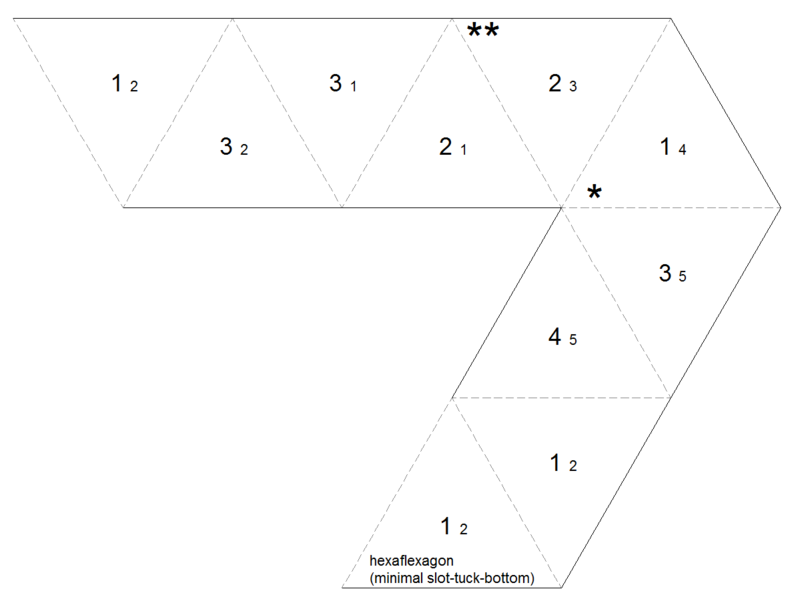 The following strip is for the simplest hexaflexagon that supports the slot-tuck flex. It requires 10 leaves and 6 pats. Click on the thumbnail to get the full sized version. Cut it out and copy the small numbers onto the back faces. Fold the adjacent pair of 5's together then the adjacent 4's together. Finish by folding together the adjacent pairs of 3's. Tape together the two triangle edges with the dashed lines to make a triangle. The next strip is for the simplest possible flexagon that supports the slot-tuck flex, which is a pentaflexagon. It requires 9 leaves and 4 pats. 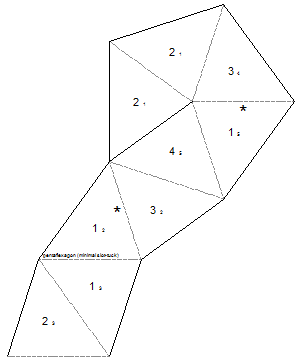 Use the same directions as above when making this flexagon. When performing the slot-tuck on a pentaflexagon, you only slide a single leaf through the slot, rather than two as with the hexaflexagon. There's another variation of the slot-tuck called the slot-tuck-bottom. You perform the flex exactly the same as the slot-tuck flex except for the final step, where you unfold the flexagon from the bottom instead of the top. Note that the slot-tuck works on a pentaflexagon but the slot-tuck-bottom doesn't. But, unlike the slot-tuck, it isn't its own inverse. In other words, you can undo the slot-tuck by turning over the flexagon and doing the slot-tuck a second time, but the slot-tuck-bottom doesn't allow this. To undo it, you must perform the operation in reverse. 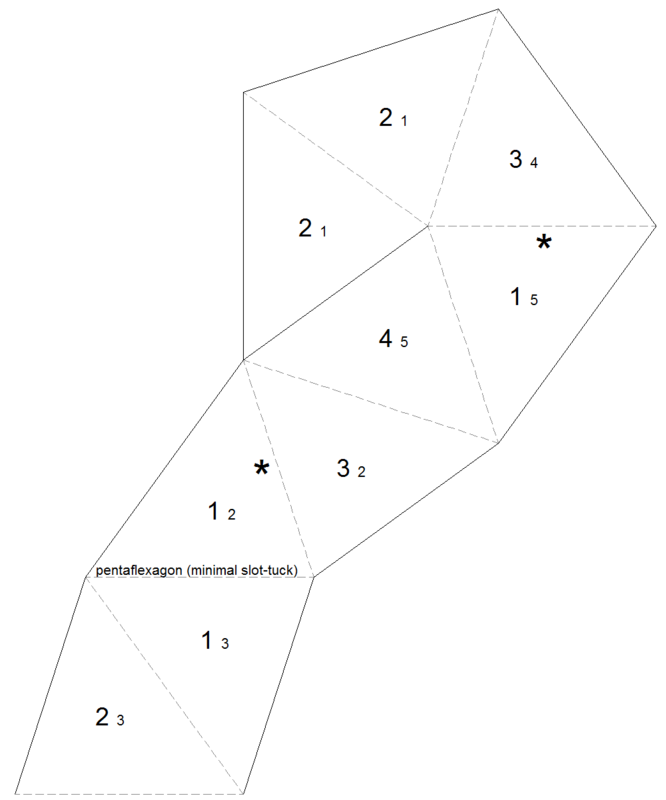 Below you can find the minimal hexaflexagon for the slot-tuck-bottom.